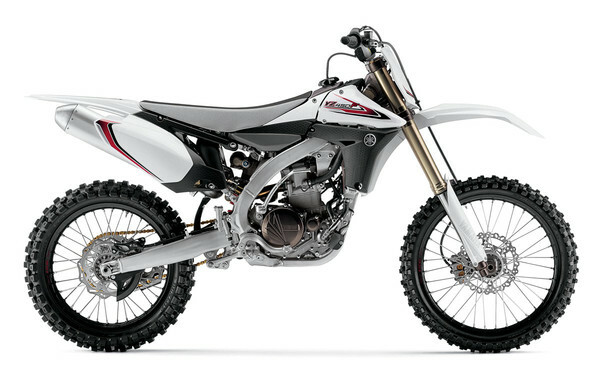 Here's a first peek at the new Yamaha four-strokes. Black rims, gold chain, Dunlop MX51 tires, and a longer muffler are among the big changes for the 450. On the 250, you'll find a larger carb, but no fuel injection. There's also a hopped-up CDI, new piston, crank, air cleaner, and muffler mods in the engine, and a host of chassis changes. 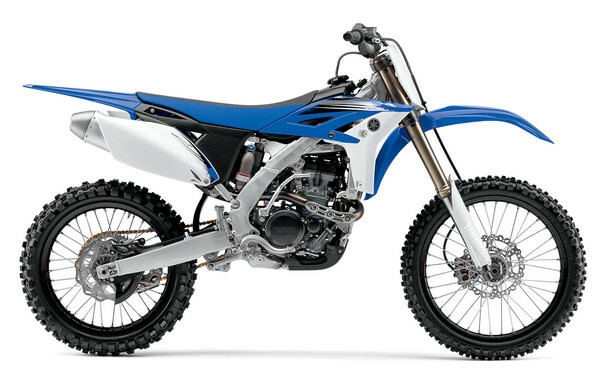 Click the following link if you want more views of the 2012 Yamaha YZ250F and 2012 Yamaha YZ450F. 2012 YZ250F. Click image for a larger version. 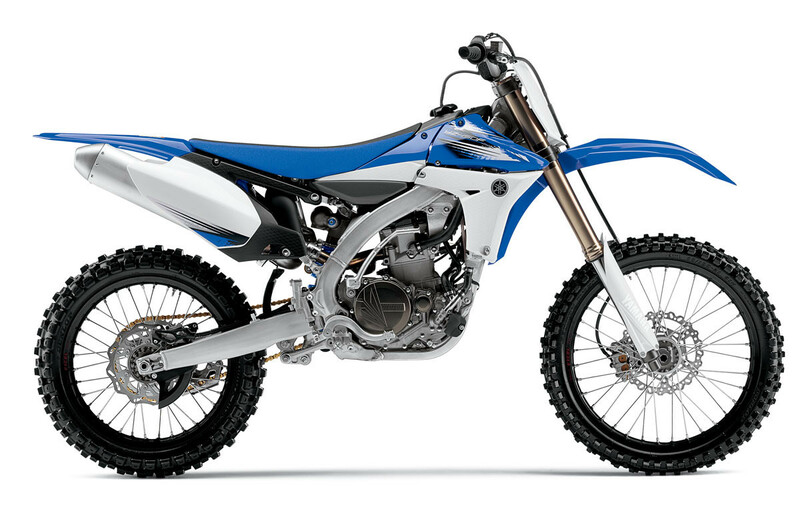 • Engine refinements, including a larger 39mm carburetor, optimized CDI, and lighter piston with a lighter piston pin, mean YZ250F has more power as well as exceptional throttle response in the mid-to-high speed range. • The crankshaft web design is revised to match the lighter piston and reduce high-rpm vibration. • The air cleaner cage is a new design that provides increased airflow, contributing to the excellent throttle response in the mid-to-high speed range. • The new muffler is designed to meet 94 dB standards. • The new Bilateral Beam frame with a revised balance of longitudinal, lateral, and torsional rigidity is used for superior cornering performance, especially while exiting turns, as well as great stability on rough, high-speed straights. • YZ250F has beefy new outer fork tubes and triple clamps. The result? An increase in the front fork assembly’s torsional rigidity for unmatched chassis stability. • Fork offset has been changed from 25mm to 22mm to accommodate the new frame design. This shortened offset increases trail length which, in turn, contributes to excellent stability and reduces the inertial moment of the front fork assembly for quick, race-winning handling. The rider can take advantage of the higher level of performance throughout the turn. • The redesigned axle block portions of the swingarm provide greater rigidity to further optimize the rigidity balance between the new frame and the revised front fork assembly. • Front and rear suspension settings have been optimized for the new frame design, including a shock that uses a 16mm shaft for optimal hydraulic flow, resulting in exceptionally smooth suspension and great traction capability. • New seat foam material has an excellent cushion feel. • Both color options feature rich-looking black rims and a gold color drive chain. • The valve spring retainers are lightweight aluminum instead of steel, and light valve spring pressure reduces valve-opening force. Valve stem ends are chromium-nitride coated for exceptional reliability and reduced maintenance. • The exhaust port is “D” shaped instead of round. This increases velocity through the port for excellent throttle response, while enhancing the power feeling of the engine. • The low-mounted radiator is as far back as possible and the compact oil tank is positioned to achieve greater mass centralization. • The new 39mm carburetor has a venturi-shaped bore, plus recalibrated jetting and an accelerator pump. This translates to impressive response when the rider snaps open the throttle, and contributes to superb mid-to-high-rpm power characteristics. • The intake boot offers a straight, smooth tract for excellent engine breathing and more power. The airbox is shaped to tuck neatly into the Bilateral Beam frame. • The exhaust pipe has been carefully tuned to optimize engine power, with a new muffler that meets 94 dB standards. • The new Bilateral Beam frame is crafted from a carefully chosen combination of forged and extruded aluminum pieces, all welded together to provide unmatched rigidity balance and superb cornering characteristics, as well as excellent handling on rough, high-speed straights. • The KYB® speed-sensitive front forks deliver exceptional damping feel, responsiveness, and bump absorption characteristics. • The 4-way-adjustable KYB® rear shock makes the most of the latest Bilateral Beam frame design. It’s low in the frame for excellent mass centralization, with a 16mm shaft and new settings for optimal hydraulic flow. • The tank, seat, and rear fender are flat and the relationship between handlebars, pegs, and seat result in a natural, more forward riding position that facilitates rider movement. The fuel tank is placed toward the center of the bike for mass centralization. • The ProTaper® bars are 4-way adjustable, and handlebar mounts and foot pegs optimize rider position on the chassis. Seat cushion material is updated for great rider comfort. • Riders have a choice of two color options: Team Yamaha Blue/White or White/Red. Please refer to the Yamaha Accessories & Apparel Catalog or go to yamaha-motor.com. 2012 Yamaha YZ250F. Click image for a larger version. 2012 Yamaha YZ450F. Click image for a larger version. • Revised fuel injection settings (mapping for injection and advance) offer smooth, controllable engine response in the low-to-mid-rpm range. • New, longer 94 dB muffler. • ECU programming is updated to optimize performance characteristics with the new-spec muffler. • New front and rear suspension settings and valving deliver exceptionally smooth suspension performance. • Dunlop® Geomax® MX51 tires provide great all-round traction. • The rearward-slanted engine allows for straight intake and exhaust ports, creating the most direct path for airflow into the fuel-injected engine for incredible performance. • The YZ450F uses a battery-less fuel injection system with a 12-hole injector for superb fuel atomization. The 44mm Keihin® throttle body is designed for easy starting, with an integrated cold start and idle speed adjustment knob. Yamaha FI provides optimal air/fuel mixtures in all altitudes and wide range of temperatures for outstanding throttle response. • 14 volt/110W high output generator powers the battery-less fuel injection system. • 4-titanium valve cylinder head with a “pent-roof” design combustion chamber provides excellent combustion efficiency and unequalled power output. • The big 97.0mm bore and short 60.8mm stroke, along with a high 12.5:1 compression ratio, create a combustion chamber that delivers really impressive power. • The air filter case is up front, helping to keep dirt and dust kicked up from the rear tire away from the intake system. • “Tornado-style” exhaust header with resonator efficiently scavenges exhaust gasses and helps the engine achieve its exceptional low-to-mid-rpm torque characteristics, while the longer muffler meets the latest noise standards. • Clutch and transmission components are designed to give the rider positive and precise shifting feel. • The aluminum double “S” bend Bilateral Beam frame is crafted from a carefully chosen combination of forged and extruded aluminum, 16 components in all, for the right rigidity balance and light weight. A very symmetrical chassis design promotes nimble handling, letting riders enter and exit corners as quickly as possible to put the competition behind them. • Skid plate is constructed from tough polypropylene for great protection and low weight. • The swingarm and rear shock are designed, with the shock mounted along the central axis of the frame, taking advantage of the space not needed for a traditionally configured engine’s airbox. This optimized combination delivers exceptionally linear performance for excellent bump absorption and awesome cornering ability. • The KYB® Speed Sensitive front fork has excellent feel and shock absorption. • KYB® rear shock includes a large capacity piggyback reservoir and 50mm piston for consistent damping control. • Fuel tank is positioned underneath the seat, contributing to the centralized mass. The seat is long and flat to allow free rider movement, and has new seat foam material for an excellent cushion feel. • The triple clamps have 22 mm offset for unequalled cornering performance. The ProTaper® bars are 4-way adjustable to accommodate a wide range of riders. • The front and rear fenders, along with the number plate, side cover and front fork protector have been designed for an aggressive look. The bike’s minimalistic design accentuates its handling character. A minimum of plastic means the lightweight aluminum frame can be exposed for an enhanced performance look. • Fuel pump is small and lightweight, as is the compact transistor ignition unit. i heard the 250 lost 2 hp or something like that between efi and quieter silencer so decided to stick with carb. who knows? not me; just saying. 2011 looked soo much better. The white one may have been the best looking production bike ever. Yamaha dropped the ball losing the red sear cover! As far as the 250? WTF, come on now! No EFI on the 250? why is that? do the other brands 250f's have efi? Im glad I went to Hondas. Damn Yamaha your just dropping the ball. Come on Yamaha you really are messing up with the 250. Like realy still not fuel injected? Come one!